If you have a question about BioShock Infinite's characters, then PAX is the place to be. BioShock Infinite voice actors Troy Baker and Courtnee Draper, who play Booker DeWitt and Elizabeth respectively, will join Irrational's creative director Ken Levine on stage at PAX Prime, in a panel all about the game's characters. According to the PAX Prime schedule, the panel will look at the focus on evolution of the characters of Booker and Elizabeth, as well as their in-game relationship and its effect on the player. Baker has dozens of animation and videogames roles under his belt, including Vincent in Catherine, Snow in Final Fantasy XIII, and Alec Mason in Red Faction: Guerilla. Draper doesn't have as much voice acting experience, but she has a lot more traditional acting experience, having appeared in numerous TV shows. Characters have always driven the BioShock games, from the grand oratory of Andrew Ryan, to the crazed antics of Sander Cohen. 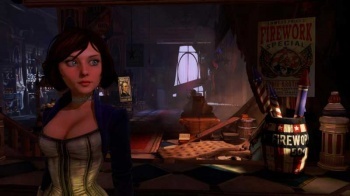 Infinite won't be the first time players have had someone talking to them during their adventures, but it is the first time - at least in the BioShock games - that the protagonist has been able to talk back. The BioShock Infinite panel takes place on Saturday, August 27th in PAX's Unicorn Theater. The game itself comes out for PC, PS3, and Xbox 360 in 2012.